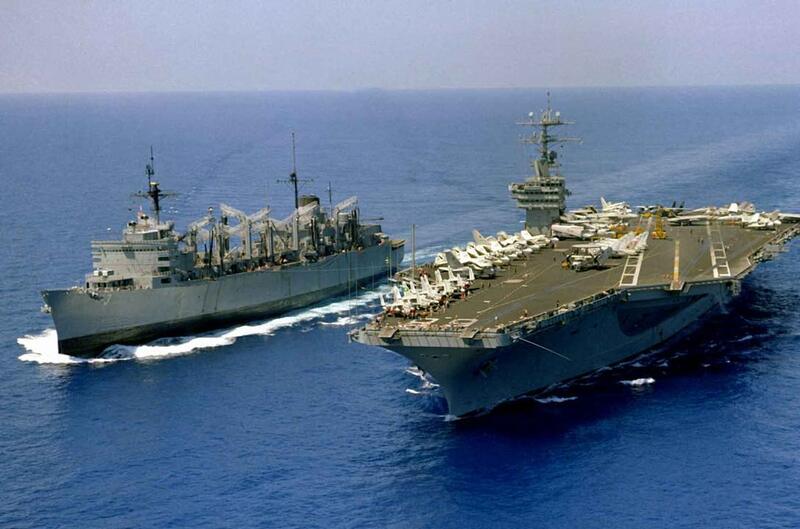 On May 26, 1998, Nimitz began a mid-life refueling overhaul that will enable her to provide her nation with a second quarter century of service. On 21 September 2001, after sea trials in the Virginia Capes, Nimitz began her transit around South America to her new home port of NAS North Island in San Diego, California, arriving there on 13 November 2001. Aircraft from Carrier Air Reserve Wing 20 were embarked for the transit. From January to May 2002, she underwent a four month post-shakedown maintenance availability at North Island. Nimitz's eleventh operational deployment began on 3 March 2003. She relieved USS Abraham Lincoln in the Persian Gulf in mid-April 2003, launching Carrier Air Wing 11 aircraft sorties over Iraq in support of Operation Iraqi Freedom (OIF) and Afghanistan in support of Operation Enduring Freedom (OEF). She returned to San Diego on 5 November 2003. Nimitz and CVW-11 were awarded the 2003 Battle "E" and Flatley Award in early 2004. Nimitz, again with CVW-11 embarked, deployed to the Persian Gulf on 7 May 2005, returning on 8 November 2005. This deployment marked three decades of service, and was depicted in the Emmy award winning 2008 PBS documentary series Carrier. In June 2006, Nimitz was awarded the 2005 Battle "E". The carrier departed North Island for her thirteenth deployment on 2 April 2007 to the Arabian Sea, relieving USS Dwight D. Eisenhower in support of OIF. She anchored off Chennai, India on 2 July 2007 as part of efforts to expand bilateral defense cooperation between India and the United States. [ Sailors participated in community work in Chennai prior to departing, on 5 July 2007, along with the destroyer USS Pinckney towards the Persian Gulf. She returned to North Island on 30 September 2007. On 24 January 2008, Nimitz deployed to the Pacific for a "surge"-deployment. [ On 9 February 2008, two Russian Tu-95 'Bear' bombers overflew the carrier in the Western Pacific. Four F/A-18C Hornets were launched when the bombers were 500 miles (800 km) away from the U. S. ships, and intercepted the bombers 50 miles (80 km) south of Nimitz. Two F/A-18s trailed one of the bombers, which buzzed the deck of the carrier twice, while the other two F/A-18s trailed another TU-95 circling about 50 miles (80 km) away from the carrier. Reportedly, there was no radio communication between the American and Russian aircraft. According to the Department of Defense, one of the two aircraft was said to have flown above Nimitz at an altitude of 2,000 feet (610 m). On the same day, Russian aircraft entered Japanese airspace, which caused the Japanese to raise protest to the Russian ambassador in Tokyo. [1 Again, on 5 March 2008, a Russian bomber came within 3 to 5 nautical miles (6 to 9 km) and flew 2,000 feet (610 m) above Nimitz and its battle group. Two F/A-18 fighters intercepted the Russian aircraft and escorted it out of the area. Nimitz was awarded the Navy Battle "E" for battle efficiency for 2007 along with the Ney award for food service excellence. She returned to her homeport of San Diego, California on 3 June 2008. Nimitz Strike Group, including CVW-11, departed the States for a scheduled Western Pacific deployment on 31 July 2009, and began to fly combat missions in support of Operation Enduring Freedom 21 September. In 2005, Nimitz participated in the filming of the PBS production of the miniseries Carrier (documentary). In January 2010, while in the Persian Gulf, the ship was awarded the Meritorious Unit Commendation for its back-to-back deployments in support of the wars in Iraq and Afghanistan in 2007 and 2008. The award was presented by Admiral Gary Roughead in a ceremony on the ship on 6 January 2010.